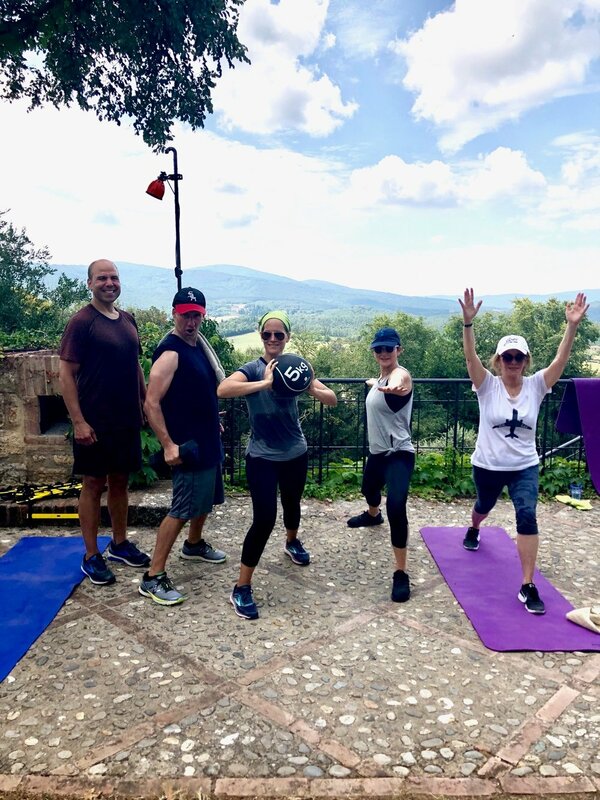 Join health, wellness and weight loss expert, Liz Josefsberg, in the Tuscan countryside for an unforgettable, life changing adventure. During this week long journey, you will be inspired, uplifted and challenged to be your best you. Daily meditations and workouts will be balanced with some of life's great pleasures, because enjoying the best things in life is a key ingredient to achieving your goals. 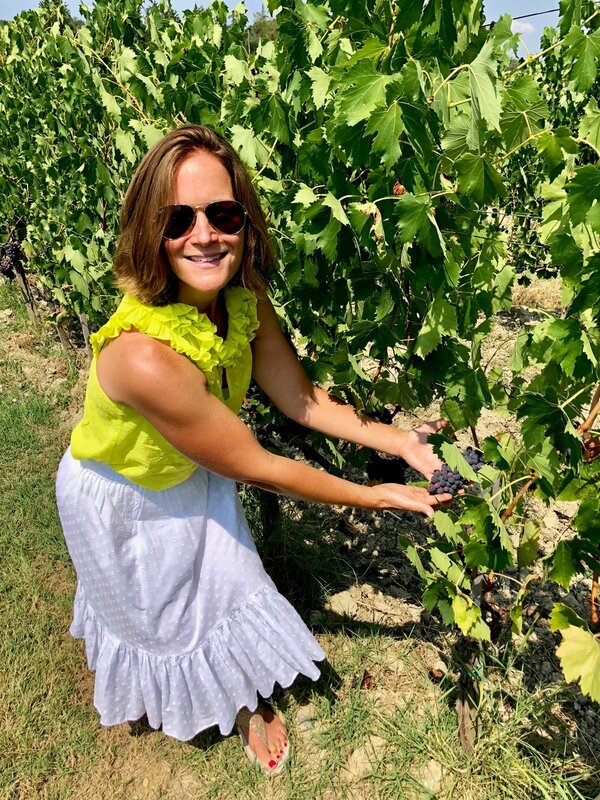 With over 15 years in the health, wellness and weight loss industry, Liz has one simple mission: to educate, empower, and inspire others to live and sustain healthier lives. After her own weight loss success journey, Liz worked as the Director of Brand Advocacy for Weight Watchers before starting her own consulting firm as a wellness expert. Liz counsels both high-profile talent and everyday clients in all areas of weight loss, balance and nutrition, and may be best known for her hands on involvement helping Oscar winning actress and singer, Jennifer Hudson, lose weight and transform her life. 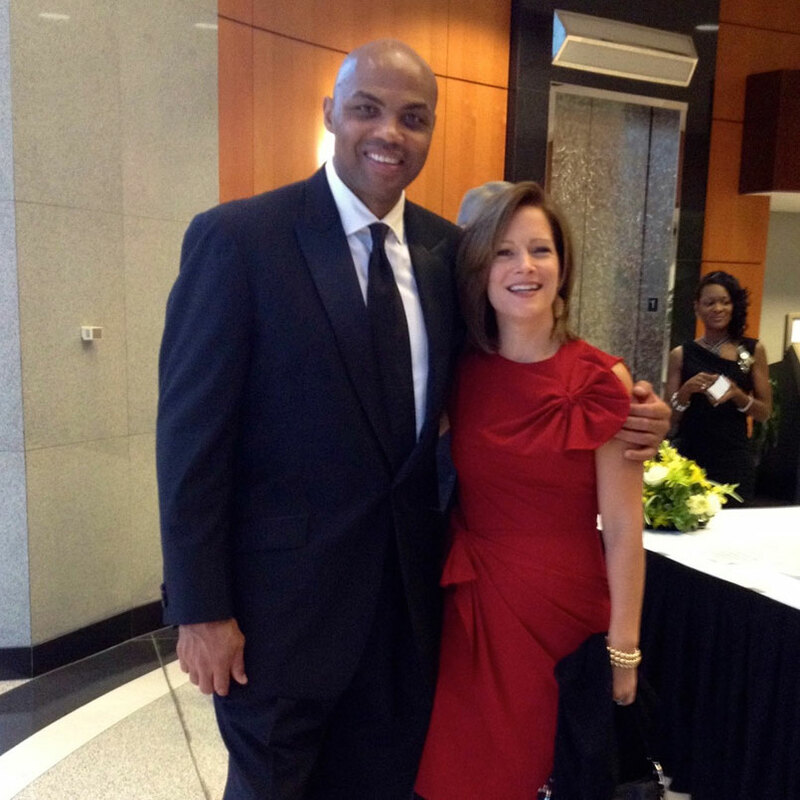 Liz’s roster of celebrity clients also includes Jessica Simpson, Charles Barkley, Katie Couric, Suze Orman, and Amber Riley, among others. She is also the author of the revolutionary “Success Handbook” (2013, Weight Watchers) and “Find Your Fingerprint”, as well as her new book ‘Target 100’ which came out in December 2017 to critical acclaim. During this magical week, Liz will lead you on a personal journey of a lifetime, educating, empowering and inspiring you to live your healthiest life through simple ideas, all while showing you that this can be done while having the time of your life. 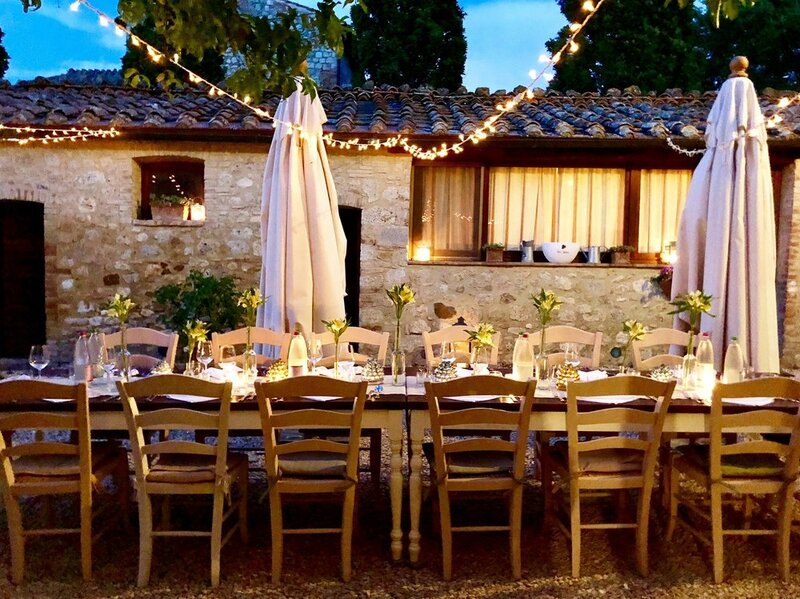 The setting for the retreat will be the 1000 year old exclusive estate, Villa Montecastello, a working organic farm and olive orchard that has been immaculately renovated to oﬀer its visitors an authentic understated luxury experience in Tuscany. Saturday: Scattered arrival to Villa Montecastello, light lunch upon arrival. Time to relax, freshen up and soak it all in. Afternoon tour of the property and farm followed by an outdoor meditation surrounded by lavender. Sunset prosecco reception and welcome dinner at Villa Montecastello. Sunday: 9.00-10.00 AM Breakfast is served. 10.00 AM Daily workout and meditation followed by a group wellness session. Lunch at Villa Montecastello. Private one on one sessions with Liz begin. Massage sessions begin. Free time to enjoy the pool, a good book and good company. 6.45 PM Meditation. 8.00 PM Dinner at Villa Montecastello. Monday: 9.00-10.00 AM Breakfast is served. 10.00 AM Daily workout and meditation followed by a group wellness session. Lunch at Villa Montecastello. 2.00 PM Depart for Siena, UNESCO Heritage site, for an afternoon of exploration on your own. Dinner out in Siena on your own. Tuesday: 9.00-10.00 AM Breakfast is served. 10.00 AM Departure for Montalcino for a vineyard tour and tasting at a boutique Brunello winery. Lunch in Montalcino with unbeatable views over wine country followed by free time to explore Montalcino. Back to Villa Montecastello for 5.00 PM pool aerobics and an evening meditation. Dinner at Villa Montecastello. Wednesday: 9.00-10.00 AM Breakfast is served. 10.00 AM Daily workout and meditation followed by a group wellness session. Lunch at Villa Montecastello. 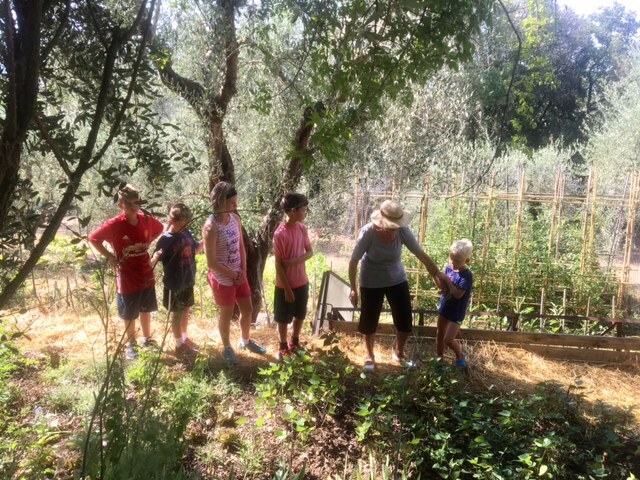 Afternoon Tuscan cooking class: Learning the importance of food digestibility and healthy fats in your diet, plus the ABC’s of olive oil. 6.30 PM Meditation. Dinner at Villa Montecastello, enjoying a meal of our own creation. Thursday: 9.00-10:00 AM Breakfast is served. 10.00 AM Morning in the kitchen with Liz for practical meal planning for every day living. 12.00 PM Depart for a winery tour and tasting with lunch. After we will visit the charming medieval walled in hill town San Gimignano for amazing gelato and free time to explore. 7.00 PM Evening Meditation. Dinner at Villa Montecastello. Friday: 9.00-10.00 AM Breakfast is served. 10.00 AM Daily workout and meditation followed by a group wellness session. Lunch at Villa Montecastello. Private one on one sessions with Liz begin. Massage sessions begin. Free time to enjoy the pool, a good book and good company. 7.00 PM Meditation. 8.00 PM Farewell dinner at Villa Montecastello: make your own pizza in our 1000 year old restored outdoor pizza oven. Saturday: 7.30 AM Meditation. 8.00-10.00 AM Breakfast, good byes and scattered departure for airports. 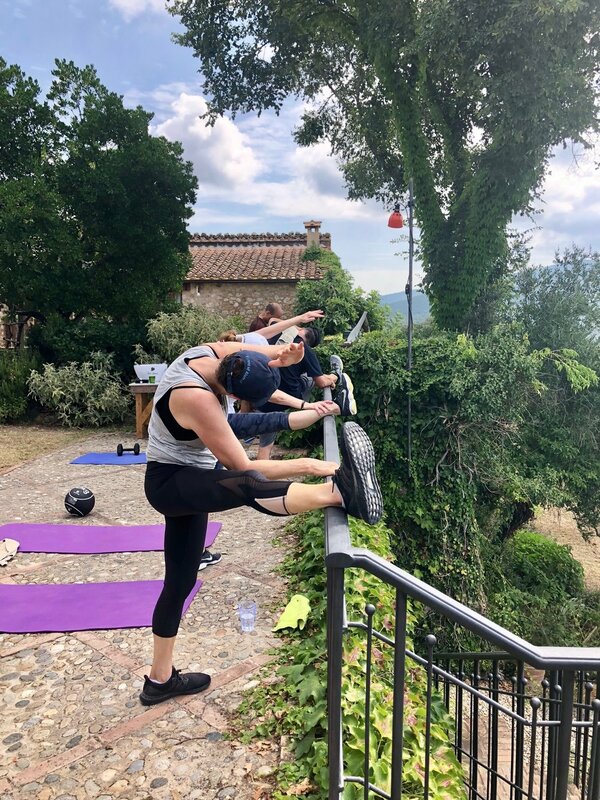 The week includes all overnight accommodations at Villa Montecastello, 7 breakfasts, 7 lunches, 6 dinners, welcome Prosecco reception, 1 massage, 2 one on one personalized sessions with Liz, daily workouts, daily meditation, all local transportation as described in the itinerary, airport pickup and drop off at Florence airport. Daily breakfast buffet includes locally baked goods and produce, coffee, tea and juice. Special breakfast items available upon request. House wine served with dinner from our professionally curated selection. Moraiolo Bedrooms #1 & #2: $6350 per person for double occupancy, $6850 per person for single occupancy - Cozy and lovely rooms with private bathrooms across the hallway, just a few steps outside the room. Bedroom #1 has the option for a King bed or two Twin beds. Bedroom #2 has a Queen bed. Frantoio Bedrooms #1 & #2: $6050 per person for double occupancy, $6550 per person for single occupancy - Two beautifully appointed rooms with an extra large shared bathroom just a few steps outside the room. There are two separate rooms in the bathroom for extra privacy, one for the toilet and one for the shower and vanity. Perfect for two friends who want their own room but don’t mind sharing a bathroom. Click here for more on Liz Josefsberg.